This is my second pastel. The subject is the pumice field on the west side of Crater Lake National Park, Oregon. The light was beautiful and I loved the way it lit up the wildflowers in the foreground, which are visually insignificant at mid day. The support is once again Canson Mi-Teiten paper. This time I used the rough side. 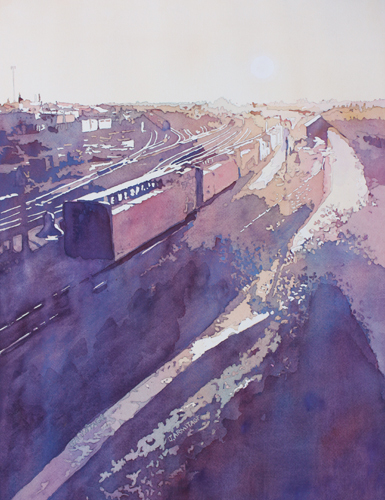 I began at the top with PanPastels’ ultramarine blue, ultramarine blue tint, burnt sienna tint and white. The rosy hills are mostly PanPastel too. I used magenta, violet tint, burnt sienna, burnt sienna pint, and finally a stick of purple pink soft pastel. The tree lines are soft pastels in various combinations of an ultramarine shade, a phthalo blue, a iron oxide stick and a dark green. The grass and pumice fields are various combinations of burnt umber, red oxide, burnt sienna in PanPastel and soft pastel sticks. I added the gold light last soft pastel. 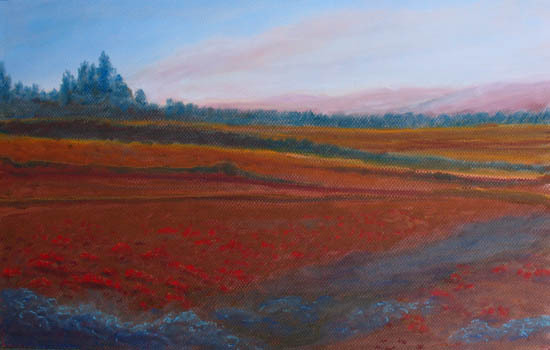 I added the shadowy path leading out the foreground with purples and blue soft pastel smudged over the pumice field. I began the red flowers by using a soft purple pastel stick to make dark bases for them. I smudged the bases in and them added PanPastel red plus a little PanPastel yellow and smudged again. I accented them with hard yellow pastel. For the blue flowers I made a darker purple base and drew thin marks over it in light turqouse blue which I half smudged. Then I added blue squiggles again and again half smudged. Prints available from Fine Art America.com.